The world's oldest twins celebrated their 102nd birthday together on Wednesday. 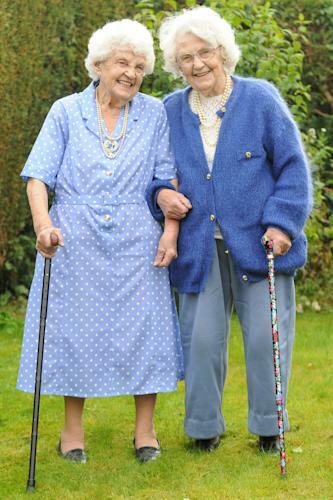 Born on January 4, 1910, Ena Pugh and Lily Millward have spent each of their birthdays together. Lily's proud daughter Dianne Powell, 65, told Wales News Service: 'My mum's recovering in hospital after she slipped and fell just before Christmas. But she's in good spirits and enjoying the attention of being one of the world's oldest twins. The English twins were born before the beginning of World War I, and they still meet up for weekly shopping trips and talk on the phone nearly every day. Lily Millward said "laughter and having a joke with each other" has been the secret to their longevity. "We used to work on the farm all day, but we would enjoy ourselves,' Millward said. 'It was a lot of fun and sociable. We've been very lucky and we have always had good health." And the twins manage to get by without some modern technological innovations, including central heating. "Until my mum's accident, they would jump on a bus on their own every Friday so they can go shopping together and have a chat over a cup of tea," Powell said. "And they ring each other almost every evening although they are both very hard of hearing--they can't really always know what the other is saying but just enjoy talking to each other."